In a city where vibrancy and energy are at the centre of your average night out, a need has arisen to make the experience a safer one; one that takes cognisance of the many aspects of socialising and the psychological consequences of this. To this end, an app using cutting edge technology has been developed with the aim of reducing late night tragedies in Galway, in particular around our waterways. Appropriately, last week The Galway Safe app was launched at the Spanish Arch on Galway’s waterfront, a location that has seen more than its fair share or tragedy and near fatal accidents involving the water. 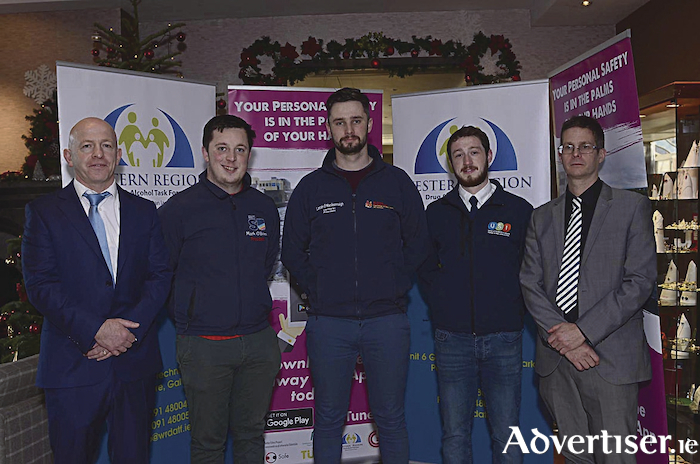 The event was attended by a range of organisations who have given their backing and support including An Garda Síochána, Galway Fire Service, RNLI, Irish Water Safety, Galway City Council, NUIG & GMIT Student Unions. In a lively vibrant place such as Galway City alcohol use, and in some cases the abuse of illicit substances, often forms part of the social life of the city, especially for students and other young people. Unfortunately the consumption of alcohol and or substances around hazardous places such as canals, rivers, and the sea has given rise to concerns around individual’s personal safety. The Spanish Arch region of Galway City and the surrounding waters has experienced many water tragedies over the past decade. As a direct consequence of these awful tragedies, the Western Region Drug and Alcohol Task Force have devised a digital app which the Western Region Drug and Alcohol Task Force believe may assist somewhat in reducing future tragedies in this area. The Galway Safe App is developed to reduce water tragedies in Galway City. It uses GPS technology to send an alert to a person who enters into designated areas around the water edge (Spanish Arch area and Wolfe Tone Bridge between the hours of 10pm-6am ) to determine their well being by sending them an alert and the opportunity to speak to one of their designated ICE numbers or alternatively the Samaritans and/or the emergency services. It is intended the geographical network will gradually expand to cover all of the waterways of Galway. In essence, the app is an adaptive public safety system capable of delivering an effective response to those at risk. Michéal Durcan, WRDATF Coordinator said that they are not selling the ‘Galway Safer’ app as a panacea to resolving deaths by drowning in this area but we hope its development can make some difference in supporting the health and wellbeing of vulnerable people on a night out in Galway City. “The app has been initially targeted at first year university students in the city with the assistance of the Students Union in both NUIG and GMIT. The reason we have chosen this cohort as our initial target audience is down to research and anecdotal feedback which suggests this period in young people’s lives can be stressful and somewhat isolating”. Roger Sweeney Deputy CEO of Irish Water Safety stated that the Galway Safe App is a very practical discreet service that will directly and positively impact students lives. The Union of Students in Ireland (USI ) and Students’ Unions across the country have always made campaigning on the issues surrounding mental health and suicide prevention a top priority. USI welcomes the great work done by the Western Region Drug & Alcohol Task Force, and their partnership with both Students’ Unions in NUI Galway and GMIT on this very important issue. “We encourage student to take initiative and do what is necessary to ensure their safety and the safety of others,” said Jimmy McGovern, Vice President for the Border, Midlands and Western Region of USI. “The Galway Safe App is a brilliant initiative that will only be a positive contribution to the student population. This app should be an app on every students’ phone from NUI Galway. “The NUI Galway Students’ Union welcomes this initiative and will do everything it can to promote it amongst the student body,” said Lorcán Ó Maoileannaigh Uachtarán, Comhaltas na Mac Léinn OÉ Gaillimh President, NUI Galway Students’ Union. Detective Inspector Michael Coppinger from Galway Garda Station said that the Gardai in Galway are delighted to support this initiative, by the Western Region Drug & Alcohol Task Force. “We would urge young and old to download the app, as we believe it will help to keep people safe and indeed save lives,” he said.